Many of the facilities within this database are intuitive and can be navigated like any other website. There ARE however some features that are unique to this website, and others that can be overlooked. This quick tutorial will help get you started and then guide you through some of these features. Which device is best to use? Smartphone, Tablet, Laptop or Desktop?? While the website is viewable on all devices, the bigger the screen the more enjoyble the experience. Some of the charts displayed within the website are very large, so large desktop screens are best to view these. How do I gain access to the whakapapa? 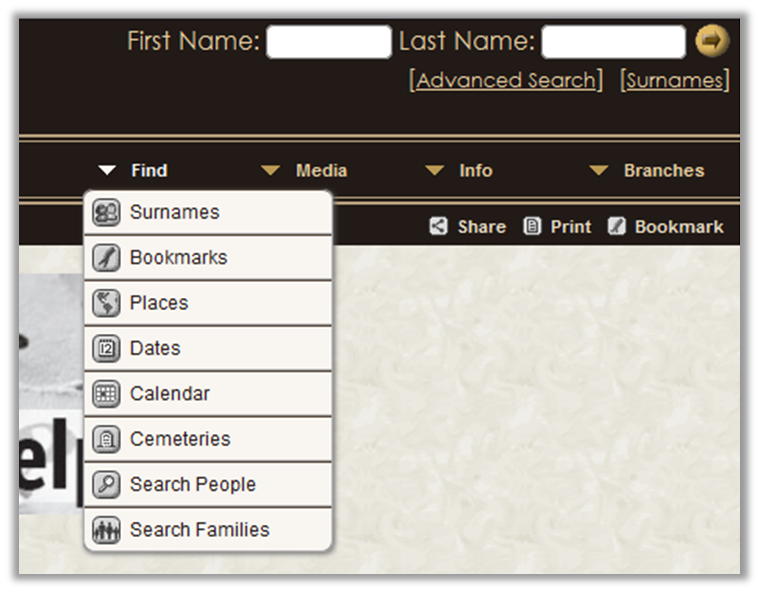 To gain access to the genealogy records within this database, you will need to navagate to the *Login page and enter your username and password (login codes). Please be aware that these are case sensitive. *There is a convenient log in/log out link on the site header. I have forgotten my log in codes. How do I get these resent to me? 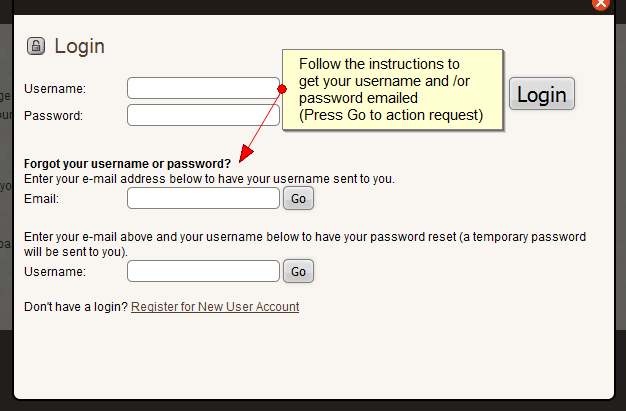 If you ever forget your log in codes, you can get them resent via the Login page. Follow the "Forgot your username or password?" instructions, and your username or your new password will be emailed to you immediately. If you have fogotten both your username and password, you will need to get your username sent first and then a new password sent after that. I have no log in codes. How do I get them? If you have no log in codes, you will need to register for a new user account and submit your whanau affiliation. Registration applications are normally processed and log in codes emailed to new users within 48 hours. The use of whakapapaonline.com is subject to our Terms and Conditions. Where do I start exploring? 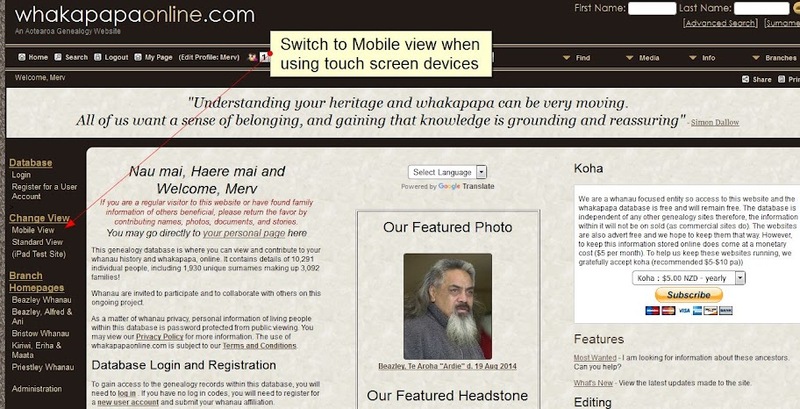 After logging in, most people like starting at their own indivdual page and then explore the whakapapa from there. You will encounter many links and icons on your page and throughout the site. Most of these are self explanatory and are covered in the sections below. 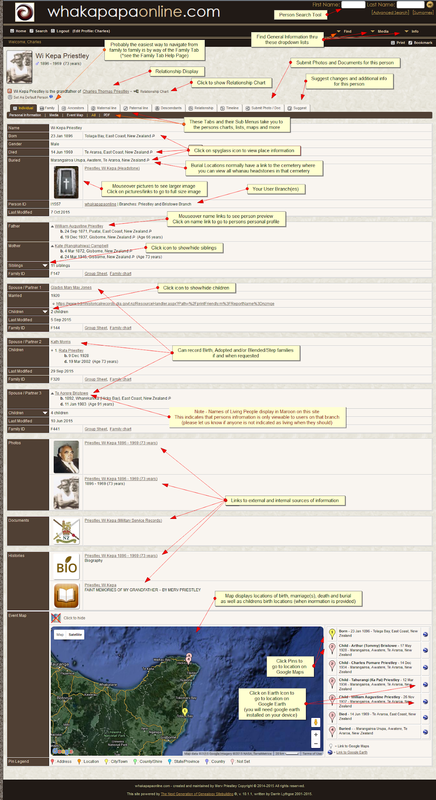 This is YOUR whakapapa, so feel free to look around; you can't break it. But if you find anything wrong, or page errors, please let us know so we can fix it! What information is avaliable on my/others Individual Pages? 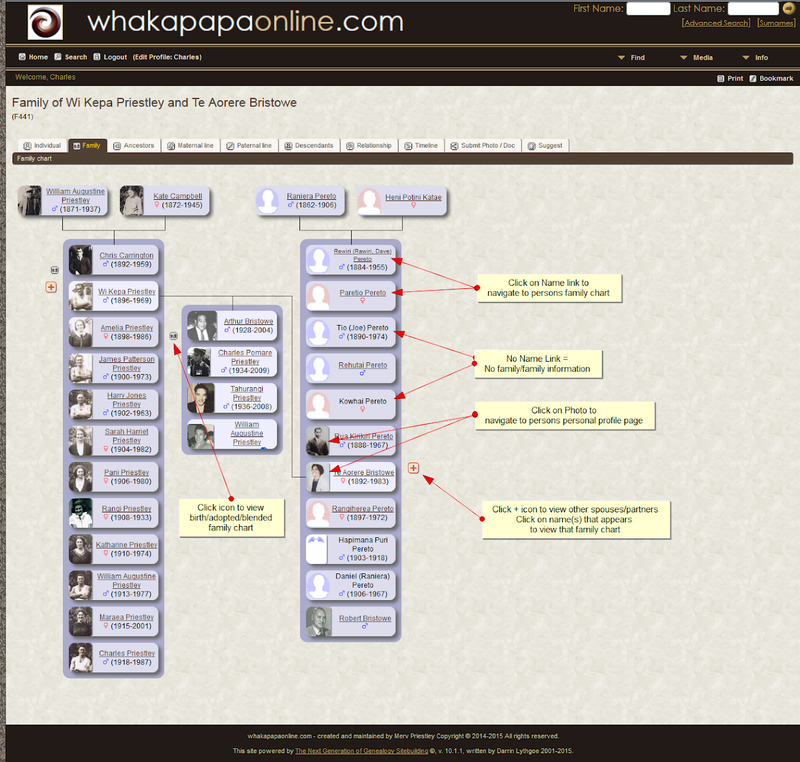 Individual Pages can contain a wide range of information on every individual on the whakapapa. They can store a persons life story if whanau choose to do so. Whanau have never before had a platform to store and share the lives of their tupuna within the private confines of a centrally based whanau forum... but now you do. Where do I find the Whakapapa Charts? These are generated through the tabs on the the main menu bar. Clicking on "Surnames" - this will give you the master listing of surnames in the database and allow you to drill-down by surname, which will give you a list of people to choose from. Click on "show all surnames" to get an alphabetical listing of all surnames in the database. Searching for a name in the database - If you know who you are looking for, then you are already halfway there! Just use the Search box on the right side of the home page (surname on top! ), and you will be shown all the records in the database that match your request. If you need to be more specific in who or what you are looking for, use the "Advanced Search" feature on the home page or by clicking on the search icon in the upper left hand corner of every page. There, you can specify several different criteria to search against, including birth and death information as well as spousal information. You can even search by event or place. (b) if you also know her first name, click on the "Search Families" link and then you will be able to enter both the husband/partner's name and her first name. How do I know if and how I am related to specific people on this site? If you can see a persons full name, it is very likely that you are related to them. On their personal page, the relationship display (below the profile picture) will describe that persons relationship to you. If you then click on the relationship chart text, the relastionship chart will display their relationship to you. Why can't I see all the information on certain people? This is because they are not a blood relative of yours. You are designated a whanau branch which provides you an extra layer of privacy and also filters out information that is not relevant to you. If you know you are blood related and still don’t see their information, please contact us as your branch and/or your profile may need to be updated. Can I search for other stuff? In the header dropdown menus is where you can find general database information and statistics If you mouse over these, the various selections that appear will provide you with the relevant information and statistics as indicated. How do I edit or submit information on an individual? 3)	The Submit Headstone Facility is located in the burial section and is where you may submit headstone photos and information for that individual. This information is then automatically sent to us. The identity of the individual or family you are referencing is automatically attached to the message when you make a suggestion. We will evaluate your information and add it to the database (normally within 48 hours) and return email you to confirm your database update. What information can I submit? Everthing and anything. Any type of media can be attached to an individual profile or attached to multiple individuals ·	Photos, Biographies, BD&M Certificates, Service records, Obituaries, News Articles, Family Stories (If it can be scanned – It can be submited) ·	Links to all the media types above as well as Social media pages, social media stories, online photo albums, online videos (If it is online – it can be linked) ·	The possibilites are endless. What about whangai, adoptions, step families and blended families? We can cater for relationships of all cultures. Be it, maori, polynesian, european, traditioinal or modern family set ups. 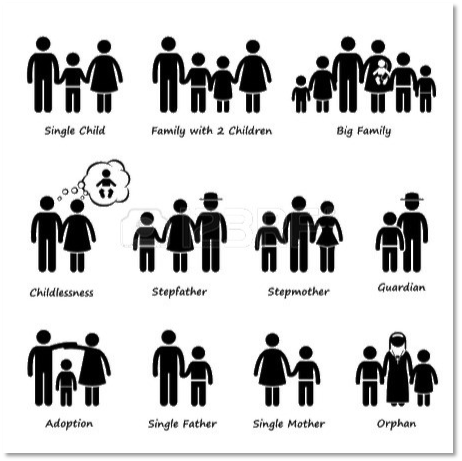 Individuals can have birth parents, whangai parents and can be part of blended/step/extended families. Ties of aroha can be stronger than ties of blood for many maori and non-maori alike. We at whakapapaonline.com understand this, and will document these ties as you wish. 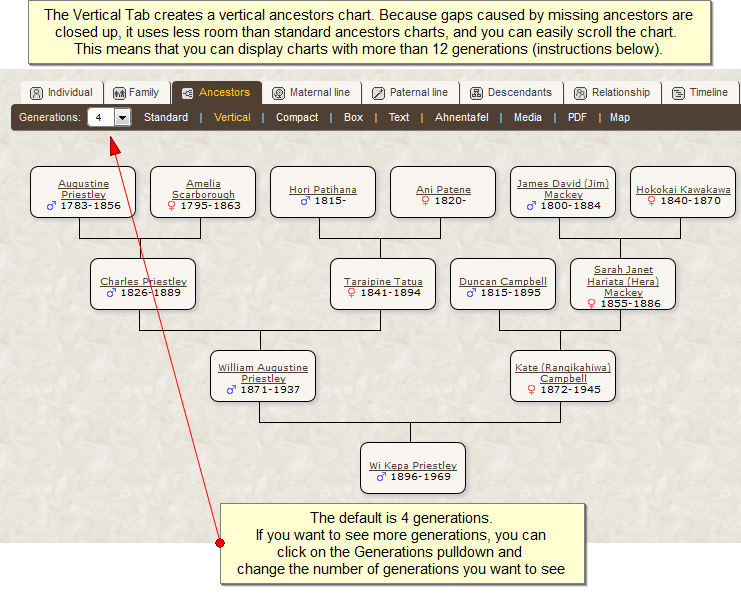 Many of my direct tupuna are missing from the database but are not blood relatives to the branch that I am assigned to. Can I submit their information? As tupuna information is not restricted and is viewable to all logged in users, they and their information can be added to this database – no problem. Can I submit information on my living relatives that are not blood-related to the branch that I am assigned to? For this, we would have to start a new branch. This is to protect the privacy of your living relatives in your current branch and your living relatives in any new whanau branch. Please contact us to discuss. Can I edit directly in the database myself? Although there is provision for users to edit directly to the database, it is a very precise process. We have trialled this in the past with detailed instructions but have found that most users found it very difficult. We ended up spending a lot more time fixing their mistakes than simply entering the information ourselves. It is easier for the administration and users alike for users to send in their submissions and for the administration to enter this data. We are however always on the look out for new editors and whanau that are keen to help. Please contact us if this is you and we can set you up as an editor and provide you the editing insructions. We are also always on the look out for new editors and whanau that are keen to help. Please contact us if this is you and we can set you up as an editor and provide you the editing insructions.